Growing up, Dr Meng Quah-Shepherd (Dentist) dreamed of being an architect. Her passion for creativity and artistic design morphed into designing beautiful smiles and facial profiles. She received her dental degree in London in 1984 and has been focusing on general and cosmetic dental services for the last 30 years. Her team members say “her eyes light up” when she’s working on a cosmetic smile make over! 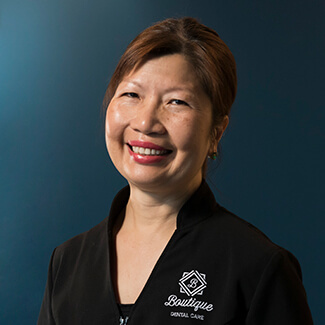 With a vision of creating individual and relaxing treatment for her patients, Dr Meng understands the close connection between the mouth and body. She knows nutrition is an important factor in enhancing the health of mouth and body and breathing and she shares what she knows with her patients so they can understand the importance of balancing life with good health. She aims not only to provide the best quality dentistry, but also the best treatment experience. Each year, Dr Meng takes well over 100 hours of professional development courses to stay abreast of modern dental techniques. She enjoys improving dental education in other countries and is currently in the developmental stage of assisting a charity in Vietnam. When she isn’t busy in the office, Dr Meng enjoys good food, golfing and dragon boating with the Dragons Abreast Sydney Club for breast cancer survivors. With the help of Dr Meng, you can enjoy a refreshing boutique experience for all of your dental services. Contact us today to schedule. We’re even open on Saturdays!